Start with brunch. There is a selection of schmick cafes at end of Bronte Road, close to the 378 bus terminus and Bronte beach itself. Why not have a sit outside at Bronte Belo? For an all day breakfast brunch, bacon eggs benedict is usually a safe bet. But this time live a little dangerously and try the bacon corn fritter. Let your taste buds have a ball. Of course, you have to wash it down with the great Australian flatwhite— a Sydney standard served with coffee art. Then go for a bit of a wander. Long walks can be one of life's delectable pleasures. Slow walks with noticing. Yes, notice what is around you: just about anything and everything. It's not that hard. Look: a pair of his and hers helmets resting on that Harley; the water temperature is nudging up to levels optimal for a swim; how empty the beach is on a weekday. Did you bring your bathers? If you're not going in for a dip, keep walking. Read the signposts. Follow the trail. Stop thinking about the things you need to do, the bills you have to pay, the knick-knack you absolutely must have. Stop. You can attend to all those things later. For now, just walk. One foot foward, then the other. No, don't be wearing them headphones. Instead, listen to the: wind; waves crashing on the rocks; nasal chatter of French tourists walking with you. Did you know that if you are desperate to find a solution to a problem that's been bugging you big time— instead of burning more time doing the same thing that hasn't been working— it might be best to give it a rest. Do another thing. Something that will use other parts of your brain. Something like, you guessed it, walking. Apparently, breakthroughs happen when new connections are made between the synapses of our nerve cells. That will not happen if you keep using the same ones. Plus, you know what they say: insanity is doing the same thing over and over again and expecting different results . So, for the love of god, don't stress your eyeballs out— go take a walk. Or in your case, the surf side. Apparently, it's better to walk on the uneven undulating surfaces of the natural landscape. After all we spent each day of 2.5 millions of years of our evolution as humans walking miles and miles around rugged landscapes in this beautifully wild planet: hunting; scavenging for food; digging roots; picking berries and nuts— you know, dolce vita of the savage lifestyle. We haven't evolved to walk on flat concrete sidewalks and manicured lawns. And worse, our bodies aren't evolved to cope with all these sitting down all day in the office, then more sitting inside cars on our way to and from air-conditioned offices. Not good. Our bodies need the right amount of physical stress, variances of the seasons, the unpredictability of the savannah. The monotony of our contemporary ultra-safe lifestyle is literally killing us albeit slowly but surely. So if you can, when you can: break the pattern. 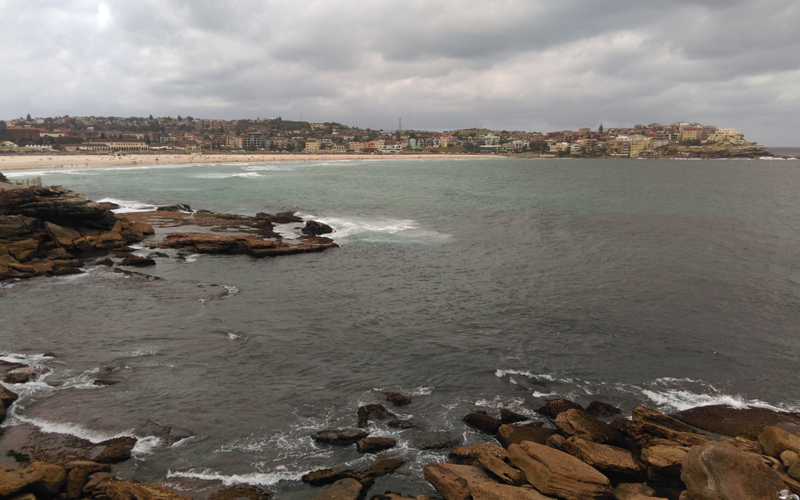 Aren't you glad you got this rugged walking track by the sea right in your city's backyard? And the views are to die for. So go get there. Don't let the tourists have all the fun.